The Honeywell System Sensor 4WT-B is a i3-Series conventional, four-wire, photoelectric smoke detector. Add the hardwired 4WT-B smoke detector with built-in thermal sensor to most existing alarm system control panels. The Honeywell 4WT-B smoke detector is not the typical conventional detector. In fact, the 4WT-B is a System Sensor i3 series intelligent detector that includes many of the same features found in analog smoke detectors. Drift compensation and smooting algorithms, standard on the 4WT-B, ensures the smoke detector does not become over sensitive as it becomes dirty or dusty. Measuring the specific sensitivity of the 4WT-B smoke detector is made easy with the unique sensitivity reader. Simply position the reader near the word "PAINT" and it displays sensitivity in terms of percent per foot obscuration. A text message then indicates whether or not cleaning is recommended. Using an infrared signal, the reader eliminates the need for a voltmeter, magnets, counting LEDs and connecting to the detector. The 4WT-B features both a local and remote maintenance signal that indicates when the smoke detector needs cleaning. Activated by the i3 loop test and maintenance module, or by any i3 ready control panel, the i3 remote maintenance signal means fewer nuisance calls and reduced maintenance costs. Installation of the 2WT-B is a breeze. The 2WT-B smoke/thermal detector incorporates a plug-in design, but without the typical added costs of a plug-in detector. The mounting base included with the 2WT-B accomodates standard back boxes or can be mounted directly to the ceiling using drywall anchors. The 2WT-B plug-in base allows pre-wiring of the installation, and its convenient terminal layout enables do-it-yourselfers to neatly dress the wires. To complete the installation, simply secure the head to the base with a Stop-Drop 'N Lock™ motion. This ensures the head will attach in less than one rotation. Turn the detector head clockwise, and it locks security to the base. Installation is a breeze. 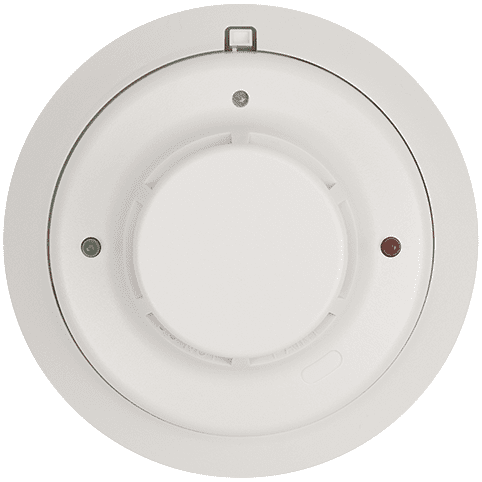 The 4WT-B smoke detector incorporates a plug-in design, but without the typical added costs of a plug-in detector. The mounting base included with the 4WT-B accomodates standard back boxes or can be mounted directly to the ceiling using drywall anchors. The 4WT-B plug-in base allows pre-wiring of the installation, and its convenient terminal layout enables do-it-yourselfers to neatly dress the wires. To complete the installation, simply secure the head to the base with a Stop-Drop 'N Lock™ motion. This ensures the head will attach in less than one rotation. Turn the detector head clockwise, and it locks security to the base. Maintaining the 4WT-B detector is just as easy. To remove the head, rotate it counterclockwise. Do it by hand, or with the convenient i3 removal/replacement tool. The 4WT-B cover and chamber are also removable, to further reduce cleaning time. When finished, Stop-Drop 'N Lock the head onto the base. The Honeywell 4WT-B smoke detector has instant inspection. Featuring both red and green LEDs, local status indication is more intuitive during power up, standby, alarm, test and freeze trouble conditions. And should the 4WT-B fall out of sensitivity, the red LED will blink every five seconds. There is no need to count LEDs. With the i3 indicators, you instantly know the smoke detector's condition. The four-wire 4WT-B smoke detector also provides loop verification via the EZ Walk loop test feature. The EZ Walk loop test, when used with the 2W-MOD module or i3 ready control panels, verifies the initiating loop wiring by placing all detectors on the loop in test mode, without having to activate the test switch on each 4WT-B detector. LEDs on the module, and on each smoke detector, provide instant status inspection, to further reduce inspection time.